Excellence is a tenacious habit. Blancpain is pursuing its successive introductions of innovative high-end movements with the new Calibres 13R5 and 66R9, derived from the 13R0, along with Calibre 5025, all now powering a set of exceptional watches. Such an unshakeable faith in the future deserved a new stellar collection, evocatively named L-evolution. The Blancpain philosophy could be aptly summed up in of Artistotle’s famous maxims : “ excellence is an art won by training and habituation ; it is therefore not an act, but a habit ”. After the two remarkable Calibres 13R0, 1315 and 225, two new movements are now enriching this exclusive series : Calibre 13R5 with date and power reserve; and Calibre 66R9 featuring a complete calendar with moon-phase display. These innovative movements, which are writing a new chapter in Blancpain’s rich watchmaking history, naturally needed to find a showcase worthy of their stature. Therefore, as the founding act of a reinvented future that begins today, the Manufacture in Le Brassus has chosen to create a new line of exceptional models, the L-evolution Collection. The Automatique 8 Jours, Moon Phase 8 Jours, Tourbillon GMT and Alarm GMT watches are thus taking up their appointed place within this new fine watchmaking sanctuary. 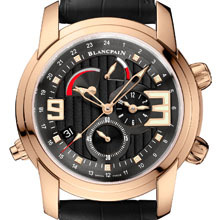 Blancpain is thus pursuing its well-established “ Tradition of Innovation ”. 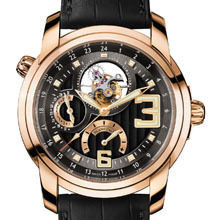 More than a mere habit, this is an abiding characteristic of the Manufacture in Le Brassus. 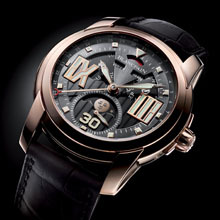 Like the first four lines of a poem in the writing, the new models form the classic new L-evolution Collection. Comprising sporty, contemporary and perfectly streamlined cases with a revamped design and an imposing 43.5 mm diameter, this new collection is resolutely geared towards the future. While already encompassing four models available in 2009, its future undoubtedly holds in store a number of other beautiful and fascinating surprises.